This park was built up over a number of decades on Toronto Island, one of a series of connected "islands" in York Harbour. (Toronto was once known as `York'.) These islands started as a sandbar that jutted out from the shore near an area known as "Cherry Beach". Then during a major storm in 1858, powerful waves washed away the connecting isthmus, isolating it from the mainland. The area was first used by local natives as a source of herbs and as a place of recreation. Then after the British arrived, the land was eventually bought by The Crown. Under Lieutenant-Governor John Simcoe, a fort was built in the 1790s at Gibraltar Point on the south west side of the then peninsula. (The Simcoe name may still be found in place and street names in Ontario.) This fort didn't last long because it was destroyed in the War of 1812 by invading American troops. The northern end of Gibraltar Point was the area that would later take on the name "Hanlan". As the city of York increased in size, the citizens used the area more and more for recreation. A sandy beach, hunting & fishing, horse races, and (then-illegal) alcohol consumption on Sunday were some of the attractions. People also began to put up residences on the island, one of which was built by the Hanlan family in 1862. In 1865, another severe storm washed their home off its foundations and into the water. It was blown ashore near the north end of Gibraltar Point where the family would reconstruct their lives. This would be the site where John Hanlan would build a single-story, 25-room hotel to service those wishing to stay on the island for more than just an afternoon. Some persons had already built summer homes in the area and John saw an opportunity to get in on the ground floor of the recreation business. The exact construction date of his hotel has not yet been located, but it appears to have opened in the early to mid 1860s, which means it might have been open before the 1865 storm. This seems unlikely given that before that storm, the Hanlan home was elsewhere on the island. Apparently some simple rides and games were put in next to this hotel, possibly inspired by Privat's, which had been destroyed elsewhere on the island by that big storm of 1858. One of the first attractions at Hanlan's was a shooting gallery. Business must have been good because in 1866, Patrick Gray opened a larger hotel south of the Hanlan establishment. It was serviced by the ferry Bouquet. The islands were transferred to the City of Toronto in 1867, with building lots being sold for houses. By 1873, the first summer cottage was erected by James Morris south of Hanlan's. Eventually, others followed and by 1876 the city had begun to actively improve the island. Fences were installed to protect swimmers at Hanlan's Point Beach and at other locations on the islands, and a boardwalk system was started. A small foot bridge from Hanlan's Point spanned across the Western Gap to allow access to the western sandbar for picnickers. It, or a later version, may be seen in the "Far Side" photo near the end of this article. Shown here is a photo of the park away from the main amusement area. Note the boats to the right. As the island's popularity increased things went well for the Hanlan family, despite the father's (John) death in 1872. The son, Ned, was a world-champion rower. 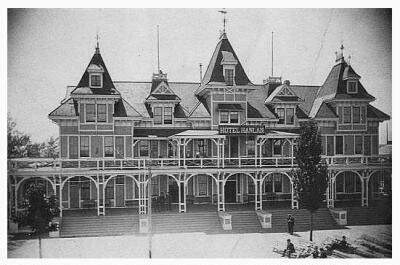 He decided to spend some of his prize earnings to build a better hotel in 1880 (1878 from another source). This one would be three stories with exterior verandahs and be topped off with dormers. The island came to be serviced by the ferry "Luella" starting that same year. Boaters enjoy the water near the Hanlan Hotel. The dormer-style of architecture is clearly evident. Note the turret structure at the left roof line. A longer shot of the hotel as seen from the side. The tower of a Circle Swing ride is just visible over the trees to the right of the hotel. Here is a closer view of the hotel, but of the opposite side from that of the first image. It shows the tennis court. This postcard view shows what is likely the rebuilt version of the hotel, as would be seen after the 1909 fire. It would resemble the old but with some nice improvements. Note the absence of the third-story verandah and usage of a wrap-around second-story verandah. Also, the ground-level entry staircases run the full length of the building. Ned's money came from his awards through competitions in Canada, The United States, England and elsewhere; some prices topped $5,000, which would be over $130,000 in today's money. As Canada's first national sports hero, Ned won over 300 races, set a world record at the Philadelphia 1876 Centennial Exhibition, and was world Single-Scull champion five years in a row starting in 1880. Even though he once lost an Australian competition in 1884, the Australians honoured Ned by naming a resort town "Toronto" near where the competition had taken place. Another investor was Ned's future brother-in-law, Lawrence Solman. 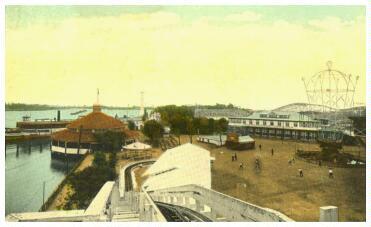 (Solman would later manage Sunnyside Amusement Park). Attractions were added, some of which were operated by J.C. Connor. He at one time had managed The Royal Theatre in Toronto. Connor was able to get a concession lease at the Hanlan Hotel starting in 1885. Some of the new attractions included waterfront boardwalks, a bandshell, a water fountain, a luxury dining room, bowling, dog swimming races, and an open-air theater with operatic performances. In 1886 and 87, the city laid out gardens on the island with lawns, flower beds, newly-planted trees, and sculptures. They continued to improve the island further with expansion of the boardwalk, the addition of new docks and a breakwater, dredging of the channels, and filling of low marshy areas. The latter was done to make more land available and to firm up soft grounds not suitable for recreation. Those prone to flooding were filled to raise them above the high-water mark. By 1889, they would reclaim over 15 hectares. In 1888, electric arc lights were installed, but it's not known if Hanlan's received electricity at that time or not. Likely, it did. Of course, all this expansion at the park drew competition, so other beaches with facilities opened on the islands nearby. In 1884, a competing hotel was built only 300 metres away from Hanlan's and nearer the beach, to boot. Hanlan's was still the more popular though, and that same year, the city leased a 150-metre stretch of lake front there for bath houses. These would compete with Wiman's Baths, which had opened two years earlier on the eastern tip of the islands. These new ones became known as "Turner's Baths", presumably after the concessionaire or manager. These would remain popular well into the 1920s. Hanlan's expanded so that by 1888 it came to include six rental cottages and a number of tenting areas. These tenters, plus others around competitors' hotels, formed The Island Campers Association. 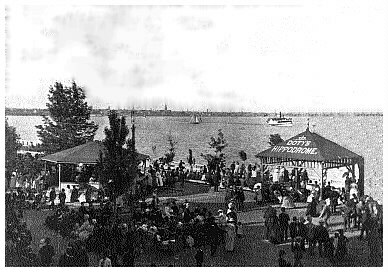 They held a water carnival on August 23, 1888 at Hanlan's Point. The expansion of Hanlan's came to include gardens with sculptures, picnic facilities, a lagoon boardwalk, a tea garden, dance hall, bandtand and a theater. It was now a full-fledged park. An 1888 Toronto Globe newspaper article mentions that games included shooting galleries, those for proving one's strength, or for testing endurance via the then-new marvel, electricity. Side shows featured The "Museum of Living Curiosities" with a 230-kilo fat lady, a South American wild girl, and an Irish-accented "Zulu" warrior. Music was by various bands of the era. There were of course, swimming and boating to top it all off. The park appeared to be open until 11 PM because that was the time advertised for the last ferry leaving the island. Also, mentioned is a regatta course, but no specific dates have surfaced. However, considering Ned Hanlan's rowing profession, it is likely that the course would have been put in by him at the time he invested in a new hotel in 1880. It would last until 1909 when an area called "Long Pond" was dredged to form a new regatta course. A hand-tinted postcard shows the club building. 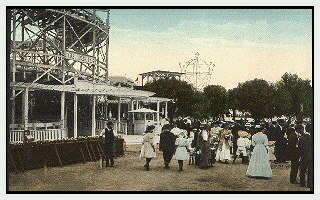 From the 1885 season and onward, rides included swings and a "Switchback Railway". This was possibly by La Marcus Thompson. He had built one at Coney Island, New York in 1884. However, an 1885 Globe newspaper report mentions the ride as being circular. That raises a possible conflict between the name and its design, although a later report refers to sliding down a hill of 158 metres. That sounds as if the ride is linear. Continuing research is trying to resolve this, but nothing has yet surfaced. However, it seems as if the "circular" term is incorrect. Also at the park was an enclosed carousel. Likely installed in 1885, but definitely by 1886, this unit, which had horses and elephants among its 20 or so animal compliment, included a band organ, and was likely steam powered, at least initially. It sat at the water's edge in an enclosed building next to the ferry dock. 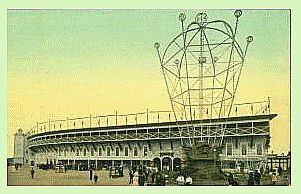 The coaster and carousel were run by the Doty brothers from 1885 (1886, if the carousel was not installed until then) through 1893. This is essentially the way this ride looked for all its life except the overhanging roof was altered and the top of the cupola was changed. The latter originally looked like a turkish roof in a candy-kiss twist style. Light strings were installed sometime after 1912 to emphasise the structure. Later, the lighted diamonds shown here were added. 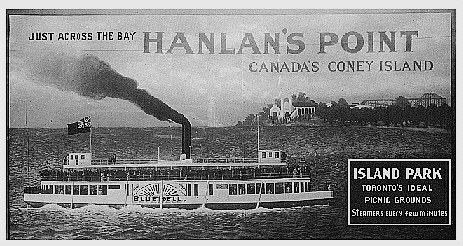 The Dotys had also managed the Hanlan Hotel in 1887 and ran a ferry company until it was sold in 1890. 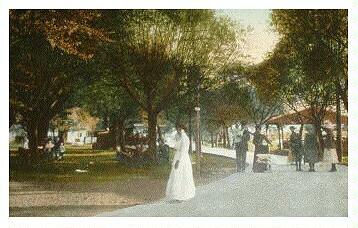 They had other concessions at Hanlan's and also a carousel at the nearby Centre Island Park. Patrons enjoy the late afternoon sun near the Doty "Hippodrome" pavilion. Note the ferry in the background. The roller coaster had an accident its second season. On May 25th, 1886, nine were injured when a car left the track at its lowest point. Some were dumped into the water left from spring flooding. Others got caught on the barbed wire fence erected to keep people away from dangerous parts of the ride. All survived their injuries. This may have been Canada's first roller coaster accident. Success breeds investors. So, as did the land-based transportation companies that often used an amusement park at the end of their lines to encourage weekend business, a ferry company wished to do the same with Hanlan's. 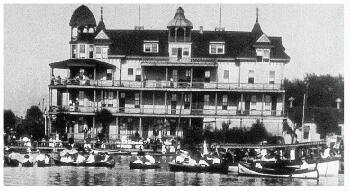 The Toronto Ferry Company bought Ned Hanlan's share of the resort for $50,000 in 1894. They then proceeded to invest a quarter of a million dollars (an incredible sum for the time) to buy up additional land and to place rides and attractions on the original hotel land and the new parcel. 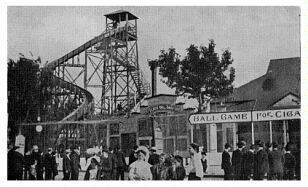 The park, which reopened in 1895, had an area totalling about five hectares and came to include rides such as a miniature train, wet and dry slides, more roller coasters, the "Human Roulette Wheel" "Old Mill", "Giant Swing", and an Ingersoll version of a "Circle Swing". The "Circle Swing" was sometimes referred to as a "Swing Around". It appeared in the park around 1905 or 06 where it is seen in photographs. It had six 8-passenger gondolas suspended from a central tower. The cars swung out as the ride turned. (A full description of a Traver model may be read in the Scarboro Beach Park article.) 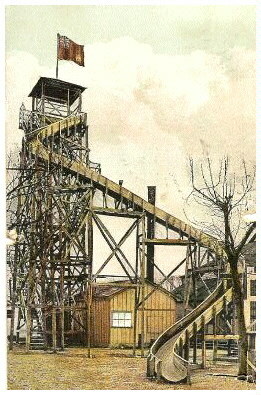 By around 1910, the ride would be reduced to just a tower with gnome theming. Reports say that the Ingersoll models never ran well and other parks converted theirs to similar themes or to fountains to avoid the expense of upkeep or possibility of an accident. Behind the ride is part of the lacrosse field and the 1904 stadium. Toronto is in the far background. Two book sources mention a new roller coaster called The "Big Scream" which opened with the refurbished park. No coaster-specific sources list this ride, so its existence is in contention at this time. As well, there is a possibility that it was not a roller coaster, but some other amusement ride. If it was a roller coaster, it may have replaced The "Switchback Railway", but it's possible both ran for a period at the same time. As well, a newspaper report on the 1909 fire (detailed farther on), mentions the switchback, so that ride may have survived until then. The park's miniature steam train is documented in several photos. Below is a photo from a 1906 advertisement. It shows a narrow-gauge railway track running along the park's tree-lined boardwalk, by then illuminated with stringed light bulbs. A small steam locomotive may be seen in the lower left pulling a coal tender and approaching a switch. Visible through the trees is a roller-coaster structure which is The Figure 8. 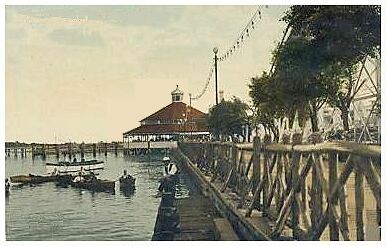 The ad caption reads in part: "Hanlan's Point: The Coney Island of Canada". 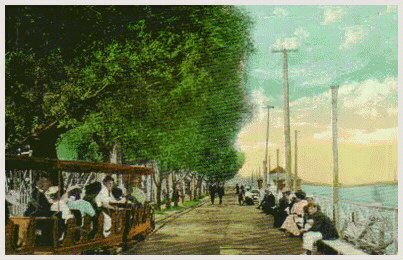 The miniature train approaches a switch as it continues its run along the lagoon boardwalk on a summer's day in 1906. Note the "Danger" sign at the switch point. The structure seen through the trees beyond the fence at the left is The Figure 8 roller coaster. 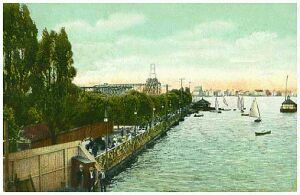 A hand-tinted postcard from a later era shows a similar view, but just a little farther along the track. Compared to the photo before this, vegetation has grown up and there are more benches along the fence on the lagoon side of the boardwalk. 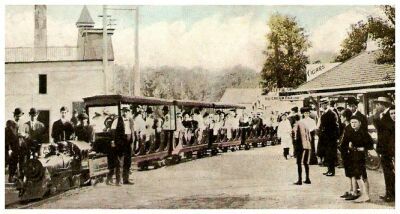 People pose for a photo near the train in this postcard view. In the right background are Cigar and Ice Cream concessions. The building at the left is not known. This view looks in the same direction as the second- and third-last photos but is taken from farther down the boardwalk and in a different year. The absence of train tracks and the smaller trees suggests this photo is earlier than those ones. To the right is a canoe concession, while at the left, the side edge of the first drop of The Figure 8 is visible. Below is shown the same area as seen from the opposite direction and from farther down the boardwalk. It was taken around the same year as the above photo. The Figure 8 structure is again seen behind the trees. The carousel building still has its original "twist" style cupola. Note at Center the person seated by the water's edge at the canoe concession. He was likely the attendant for the canoers. Above and along the boardwalk are strings of lights. In the distance, to the right of the light pole, may be seen the dry slide tower. A close up of this attraction is seen farther on. side in the "Lagoon" photos, farther on. Information has surfaced which suggests the park's train was an Armitage-Herschell model that was the first of its kind produced by the company. The locomotive was a wood-fired, one-metre tall, 381mm gauge steam engine in a 4-4-0 configuration. It hauled a five-car train supposedly including a coal tender and caboose, although one photo here shows four passenger cars, so perhaps the tender was not included in the count. A typical running speed would have been about 10 km/h. Evidence shows it to have been made at the Herschell company's North Tonawanda, New York facilities around 1896, and in the in the 1990s it was discovered to still be in existence. According to a News Niagara Bureau article by Harold McNeil, the train was originally shipped to Centre Island in Toronto. 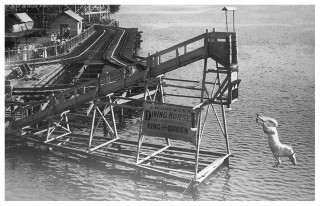 The only amusement park operating around this time on the island was Hanlan's, so this was likely the train's first home. Photo comparisons suggest that the Hanlan's locomotive was this Herschell model and that it was likely installed for the 1896 or 97 season, which fits nicely with the opening of the freshly enhanced park. The treasurer of The Carousel Society of the Niagara Frontier, Edward Janulionis, was able to locate the century-old locomotive in 1999. After the train had left Hanlan's (the year is not currently known), it changed hands various times. Research by Ottawa rail fans Bruce Ballantyne, Bernie Geiger, David Jeanes and others, shows that this train might have gone to Britannia Park in Ottawa, but photo comparisons don't match. It did though, end up with the Rotary Club in Orillia, Ontario where it was being run as a fund raiser at Couchiching Beach Park. It hauled over 20,000 passengers during the 1999 season alone. Since then, the club planned on exchanging the steam train for a gasoline model and evidently sold it. The Island Street Boatyard was secured as a sponsor and committed to buying, transporting and restoring the vehicle as a donation to The Herschell Carrousel Factory Museum on Thompson Street in North Tonawanda. The locomotive turned out to have serial number 0001, and is considered the first, and perhaps only, steam locomotive made by the Herschell company. Note that the "Magic Baking Powder" sign is not there in the "Tecumseh" photos shown here after the "Midway" photo. The first "Tecumseh" photo is dated May 24th, 1907 and shows more of The Grand Scenic Railway. It appears to have a turnaround in the location behind where the sign would be placed. At some point its track comes back to the station building to emerge as seen in the photo, twice crosses the trestle, and returns to the station where the track aligns with the lift hill. This places the photo with the "Magic Baking Powder" sign later in 1907, but not in 1908 because all of that was removed to make way for the outfield seating. 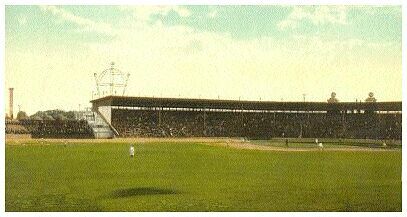 Here, the second stadium (built in 1904) may be seen with advertisement billboards at the outer perimeter and the Toronto skyline beyond. At Upper Right are two ferries near the docks that lie out of frame to the right. In front of them is part of the structure for the Figure 8 roller coaster. The ride beside that and next to the playing field is The Grand Scenic Railway. Track for it is again seen in the foreground. Compare this photo with the next three. 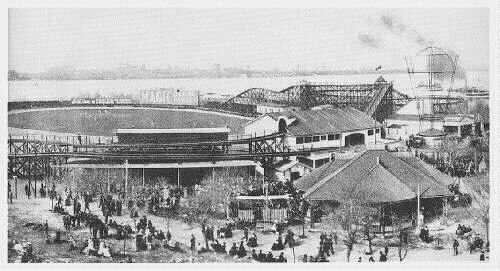 Besides the rides, park patrons might also be spectators at a sports game in the lacrosse/baseball stadium, which had been built for the 1897 season to replace bleacher seating. This was the home of the Tecumseh Lacrosse Team and the second home for the Maple Leaf Baseball Team, which had been moved by its owner from Sunlight Park on Queen Street in Toronto. He would come to move it back to yet a newer stadium on the mainland for the 1926 season. The team would continue until 1967 when it would be disbanded. Against a backdrop of The Grand Scenic Railway (built in 1907) the team poses. Compare this photo with the "Midway" one farther back. Note in the left background that the circular part of the structure (the coaster's turnaround) is not evident in that other photo. This part of the ride's framework is hidden by a "Magic Baking Powder" billboard which had to have been installed later that season. This photo shows the team playing against the "Shamrocks" in the 1904 stadium. Again note that the circular coaster structure seen here behind some of the lacrosse players would later be hidden by a billboard as seen in the "Midway" photo farther back. The modifications to the 1904 stadium are evident in this view. All the outfield billboards have been replaced by covered seating. You can also see that those two tracks in the foreground do join at the left to form a loop. The island's permanent population grew so that it eventually had its own businesses, stores, and churches, and starting in 1900, a volunteer fire department, which eventually came to have three stations. All this spawned proper streets and wooden sidewalks which made their way to the ferry docks. 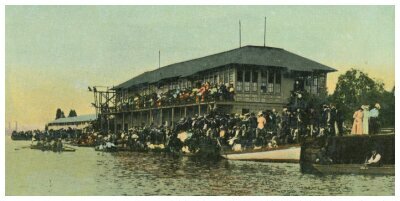 One of the multitude of ferries that came to service the island during the park's time was The "John Hanlan". 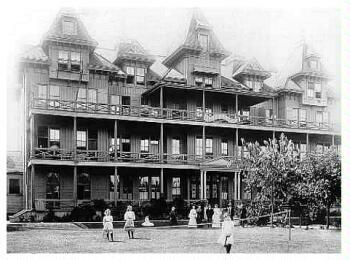 Built in 1884, it was named for the founder of the park and resort. In 1927 it would be acquired by The Toronto Transportation Commission but it was eventually replaced so that in July of 1929, The "Hanlan" would be burned off the beach at Sunnyside Amusement Park as "entertainment". 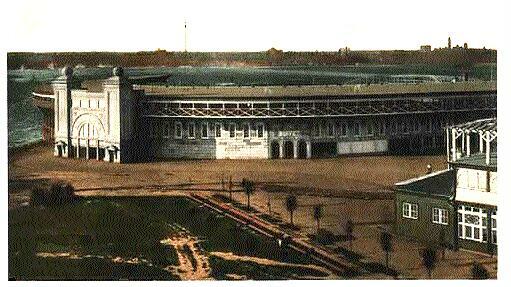 The 1897 stadium caught fire September 10th, 1903, was lost, and replaced with a larger one, as seen in the photo below. The "Big Scream" apparently survived and possibly The "Switchback Railway". As previously mentioned, the "Switchback" name appears in a newspaper report of the 1909 fire. However, the term "Switchback" was often used interchangeably with the term "roller coaster" during that era, so this report may have referred to one of the other coasters. This structure replaced the 1897 one which had been lost in a fire. 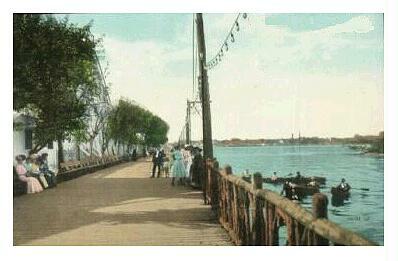 The postcard view here is before the 1908 upgrade. This stadium too, would burn during its sixth season. In 1905, a Fred Ingersoll Figure 8 coaster was built, which proved popular enough that two more coasters were added: The Grand Scenic Railway in 1907, and in 1908 a Dip the Dips joined it, both designed & built by Ingersoll and John Miller. (The Grand Scenic Railway was renamed The Royal Gorge in 1908 or 1909). A shady midway leads to the entrance of the Royal Gorge roller coaster. To the left is a white building that advertises it can clean one's clothing without it being removed. Perhaps an early form of dry cleaning? In the background a sign that spans part way across the midway advertises an attraction called Mystic River. Might this be a wet, dark ride? 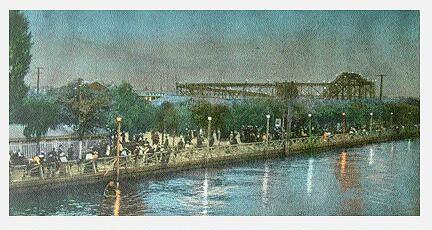 A renamed or second version of Scenic River after the 1903 fire? Or did the latter come afterward? Sometime after the first or second season, The Figure 8 had a small cupola placed at the top of the lift hill. Early photos don't show this cupola (see the following few postcards), while later photos do. (View the "Lacrosse Team" photo farther back, and "Lagoon" photo farther on.) As may be seen on top of a frame at the peak of the lift, there originally was a large number `8'. Behind and to the left of the coaster is the lacrosse field. The building immediately to the left is the "Tours of the World" attraction. On the right is the breakwater, past which the ferries would come to dock just out of sight to the lower right. The Toronto skyline of a century ago appears across the water. This photo must be 1905 or 06 because there is no cupola on The Figure 8 nor any additional coaster between it and the lacrosse field. This looks along toward the right of the above view. One of the ferry docks is in the foreground and so this photo was likely taken from a ferry's upper deck. Note the life preserver at extreme Lower Left, and beyond the fence under the trees is an unknown building with a "Tickets" sign. 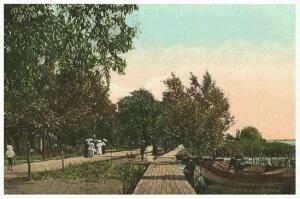 This same part of the dock and fence may be seen in the "Bluebell at Hanlan's Point Dock" photo, farther along. The Figure 8 coaster is seen behind. It sports the `8' and not the cupola at the top of the lift hill, and there does not appear to be another coaster beside it, so this shot was likely taken in 1905 or 1906. To the extreme right is part of the breakwater. The Lagoon is seen from a similar angle as above, taken as the ferry approached or left the Hanlan's dock. More of The Figure 8 coaster may be seen at the left. A car is just cresting the lift hill. Note the cupola at the top of the lift; this differs from the `8' in the photos seen above and earlier. This cupola was likely added in 1906 or 07. Just behind may be seen The Grand Scenic Railway. A train is on its way to the drop visible to the right of the Figure 8 lift. The boardwalk lining The Lagoon goes to the carousel building and the ferry docks, out of sight to the left. This poor-condition postcard is being reproduced here because it shows something unusual: The Figure 8 coaster has neither the `8' nor cupola at the top of the lift hill! Was the `8' damaged and then eventually replaced with the cupola? Was this shot taken by chance during regular upgrades in the short interval between the time workmen removed one and added the other? On the other hand, this is a hand-tinted postcard; might the artist have painted out the `8', or is it simply that the image is so poor that the `8' is unable to be resolved? Here is the side of Hanlan's near the ferry docks, which are just out of frame to the left. This photo was taken from the breakwater. At Center Left is the carousel building. The new Dips lift hill is at the right, with the Circle Swing behind. 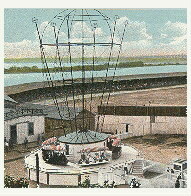 Along with the rides in the newly refurbished Hanlan Park, were attractions like the "Tours of the World" simulator, its building seen in an image farther back. Jim Abbate of Chicago says: "Patrons boarded a railroad passenger car in a building. After being seated, they were jostled as if riding the rails and they watched a variety of scenes pass them by as they gazed out their windows." Afterwards, patrons could hear music at the bandstand, see a play or other performance at the theater, swim or canoe, or enjoy themselves at the dance hall. Another attraction took the form of a new slide. This was a dry slide. A photo taken in or after 1905, but before the fire of 1909, shows a big tower across from the Figure 8 station. (In fact, the Figure 8 photo showing the station front and the Circle Swing image, both farther back, were likely taken from it.) The tower sported a long staircase leading to a covered-top landing. Leading down to the midway was a slide with a big `S' curve. Called The "Hurgle Gurgle", it's not clear if this was in addition to the old water slide or a dry replacement. Next to the tower is what appears to be a water tank which may have been a game. Beside that is one with a sign saying "BALL GAME FOR CIGARS". Next to it is The "GLASS BALL GAME". 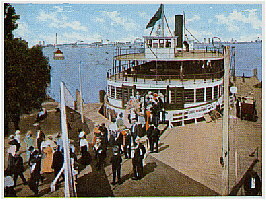 The background shows a ferry close to the dock. It appears to be The "Mayflower" or "Primrose", both double-ended ferries that were launched in 1890. Here is the Hanlan's boat dock area. At Upper Right is the Hurgle Gurgle dry slide and at Center Left are the entrances to Tours of the World and just beyond, The Figure 8. The ferry (Center, background) appears to be The Mayflower or Primrose. This is a closer view of the games and Hurgle Gurgle slide. The Hurgle Gurgle slide from the front. Note the Canadian "Red Ensign" flag above the roof. Canada would replace it in 1965 with today's "Maple Leaf" flag. 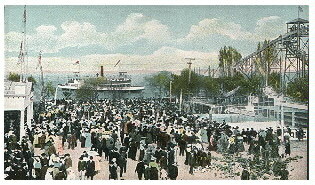 This depicts the ferry Bluebell (Launched 1906), on its way to Hanlan's. The building and coaster in the background are unidentified. The coaster may be a representation of The Grand Scenic Railway. Unfortunately, on August 10th, 1909, another fire claimed the second stadium when the Gem Theater next door caught fire around 1 or 2 PM. By the time a bucket brigade had been formed, the fire had grown too large to contain. A cashier, Clara Andrews ("Andres" from another source), lost her life when she returned to her ticket booth to save the money and tickets from the fire. According to newspaper reports, this ticket booth was for The "Switchback". This likely meant The "Switchback Railway" roller coaster, which means that ride survived until this date. Adversely, it was common at the time for the general public to refer to any roller coaster as a `switchback', even if it was a continuous layout. This is borne out by the fact that one source says the booth was for the Figure 8 roller coaster. Damages were approximately $200,000, with insurance only covering $50,000. The baseball team was forced to play out the remainder of the season on the mainland at Diamond Park. This hand-tinted postcard gives a high-angle view of the new stadium. The building at Lower Right is the dance hall. Above and beyond the grandstand roof at the right may be seen some of the Dips coaster structure. 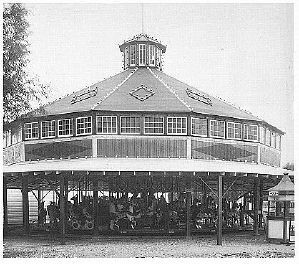 The carousel survived the fire, along with The "Circle Swing". By 1910, it had been converted to just a themed structure with huge heads sporting gnome-like faces mounted on top of what had been the central motor room. The outer room housing itself was sculpted of the same material to resemble a rocky, brick-like base for the heads. It is not known when this change occurred, but was likely after the fire because the ride had been next to the stadium, which burned. Possibly the ride cars were destroyed, but the tower and mechanism survived. However, the ride never thrilled passengers again because, as mentioned at the first, apparently the Ingersoll models never ran well and were prone to tipping, so some parks converted them to fountains. In front of the new stadium is the re-themed Circle Swing. Note the gnome heads and lights outlining the upper structure. Although not discernable in this photo, signs show "Arcade" over an entrance to the left of the Circle Swing, and that "Star Beer on Draught" was sold at this facility. This is the stadium interior. The Circle Swing tower may be seen above the bleachers at Center Left. The purpose of the tower at the extreme left is unknown but it may be the water show's high-diving tower. 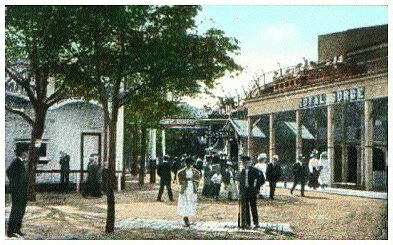 Between the stadium and one of two new roller coasters, was a huge pavilion which housed a dance hall, and possibly a theater and restaurant to replace those lost. Included in, or next to this, was a Japanese Garden. It may have been part of the restaurant or perhaps a tea room connected with the restaurant. At least some of it was outdoors. 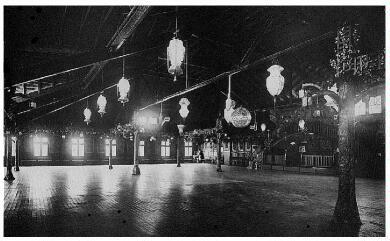 The dance hall's main floor was on the second level and was accessed via an exterior lattice-covered stairway. The top landing was covered by an open-board peaked canopy. Inside was a grand, slat-floored expanse with pendant lighting and a large mirror ball. Light from surrounding windows reflects from an empty dance pavilion floor. Note the mirror ball covered with spaced, irregularly-shaped glass. It hangs just right of center in this photo. Water seemed to be the theme chosen to market the newly rebuilt park. Many shows were added to bolster the permanent rides and attractions offered by Hanlan's Point. These included "Dancing Waters", which may have been a fountain effect. This was located close to the carousel building. 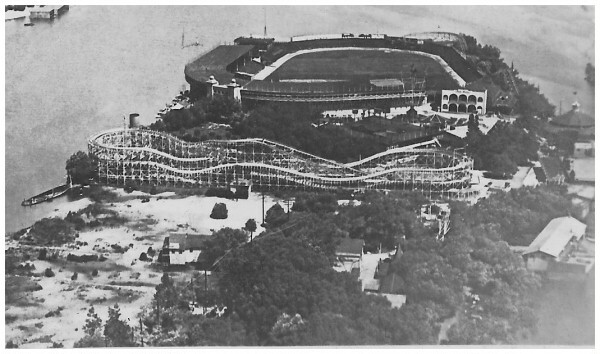 Others were "Hamburg's Big Spectacular Water Show" with acrobatic diving into a large tank, Madge MacDonald's underwater strip act (likely performed in the same tank), and Gorman's Diving Horses, where trained horses walked up a wooden ramp and dived into the Western Gap's waters near the Racer coaster's turn-around. In the photo at the left, there are two electric globes hanging near the water below and just inboard of the jumping-off point, so presumably Gorman's show could be seen day or night. earlier "Midway" photo as seen near the middle of this article. The carousel building is still seen here because it survived the fire. To the left is the new performance stage, while farther to its left would be the location of the water show in later seasons. The building at Center Right is a concession that sold beer. The ferry docks lie behind it. This view is a litle farther to the left of the above picture. The carousel building and stage are visible, with acrobats performing on the latter. The water show with its high-diving tower is at Center Left, while another water tank enclosed by a curved fence is just visible at far Center Left. Behind the building with the "Edelweiss Beer" sign at Center Top may be seen the wheelhouses of two ferries at the docks. (The `beer' building appears to have been extended compared to the previous photo.) At Upper Right, the small, two-story structure is unidentified but there appear to be musicians seated in front of music stands on the top level. The larger new coaster was variously called The Racer, Rainbow Dips, and Dips. (Likely the latter two names referred though, to the new Dips coaster that was built beside the new stadium. Once again, Fred Ingersoll and John Miller were commissioned to design and build these two rides. The Racer was so large that its long dimension nearly spanned the width of the point. Despite the Racer name, the ride was only single tracked. Rides were 10 cents. Shown is The Racer entrance. In the distance is the entrance and roof of the dance hall, and unseen below that is The Japanese Garden. Beyond the trees, lies the re-themed Circle Swing and new concrete stadium, both seen close up in a previous photo. The former ride's metal skeletal structure is visible above the tree line. Seen in the wide aerial view below, it is obvious that The Racer was a large coaster as it stretched across so much of the width of the point. There appears to be a covering of snow yet the trees are in bloom, so it's likely to be mid Autumn in this photo. From left to right may be seen the ferris wheel within the trees, The Racer, a water tower, the Dance Hall, the ferry docks, the Carousel building, the Dips station and a bit of its track, the Circle Swing tower, and the Stadium. The background waterway was known as the "Western Gap". same flight as the above, the snow is more evident. The same structures are seen again, but from an angle 90 degrees from the previous view. Looking near bottom to top are the ferris wheel, The Racer, a water tower, the Dance Hall, the Circle Swing tower, the Stadium, the Dips station and the Carousel building. 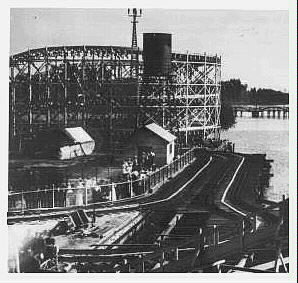 The structure with the arches to the left of the coaster station is unknown, but may be part of an expanded station for this ride. More of the Dips track layout is visible from this angle, curving around the outside of the stadium. Here is the side of the park across the point from the ferry docks. The coaster is The Racer. This is its far turn-around. The water tower in this photo and the two above will help you get your orientation. Note the tracks winding around the pier. They are likely for the park's miniature train. In the background above Right Center is the footbridge to the western sandbar. The second of the new Ingersoll/Miller coasters was simply called The Dips. Not much is known about this ride, but it was approximately on the site of where the Figure 8 and Grand Scenic Railway had stood before the 1909 fire. 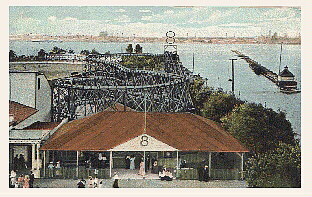 Built in 1910, no date has surfaced as to when this ride was removed but it seems to have closed in 1926, the same year that The Racer was demolished. This postcard photo is titled "View from The Dips". We are gazing down from the top of the lift hill toward a long white roof beyond the guard rail. That is the station; approach track can be seen leaving it at the left and curving to the bottom of the lift hill. Notice that the building with the arches seen in the aerial photos farther back has not yet been erected. Looking elsewhere, notice how barren everything is after the fire and razing of the ruins. To the right are the Circle Swing tower, dance hall and stadium, and in the background is the Racer coaster. By this time period, signs advertised "Edelweiss Beer" and "Star Beer", as previously mentioned. So considering this, presumably the alcohol selling ban had been lifted. Perhaps after all the fires, owners were able to persuade officials to allow the sale of beer to aid the park's recovery. Hordes leave Trillium's lower deck on a sunny morning to line up at the entrance to Hanlan's Point. This photo has several dates attached to it by various references, with August 1913 being the most specific. 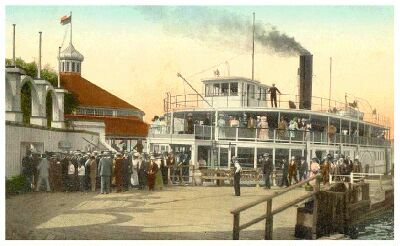 The red-roofed, round building at Center Left contains the carousel. This higher angle shot is of an adjacent dock. The ferry is the Bluebell. Note the wheeled cart at Center Right. It may have been a concession cart selling peanuts or the like. Alternatively, it may have been a luggage cart, although this dock is not the closest to the Hanlan Hotel. The breakwater is in the background at Center Left just to the right of the trees. However, garbage duty never happened to "Trillium". For some reason she was towed to one of the island's lagoons and left to rot, be pirated by thieves, and damaged by vandals. Perhaps it was found that "Bluebell" could handle garbage duty all by itself. After a local effort, the ship would be restored in the 1970s and resume service in 1976 where it would continue to run even today. Interestingly, in 1973, while "Trillium" was being taken to the shipyard where restoration would begin, it was towed by a tugboat named "Ned Hanlan II". Circa World War I ? Park-goers stroll a tree-lined promenade on a warm day. The man next to the baby carriage appears to be in uniform. 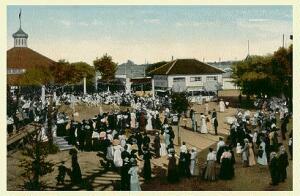 Note what appears to be a bandstand or gazebo at the right. The same or a similar structure may be seen below in a photo that could be the same area. Hanlan's continued to prosper until the opening of Sunnyside Park on the mainland in 1922. As automobile ownership accelerated after the Great War, fewer people wanted to bother with a ferry when they could drive to, and park at, a mainland attraction. As well, Hanlan's relied on live theater for a good amount of its entertainment, but vaudeville was being supplanted by the motion picture and there were plenty of movie theatres in town. Another loss came when the Maple Leaf ball team moved to their new mainland stadium following the 1925 season, after which the grounds were used for picnics and other events. That season would also be the last for the Racer roller coaster, which was demolished. (It was destroyed in 1926, so it may have run briefly that season before the wreckers came.) A 1933 high-angle photo taken from the mainland shows Maple Leaf Stadium. Within sight across the water is the old Hanlan's Point Stadium and a large clear area behind where the coaster had stood. It is thought too, that the Dips coaster ceased to operate around this time, lessening the number of attractions at the Point. 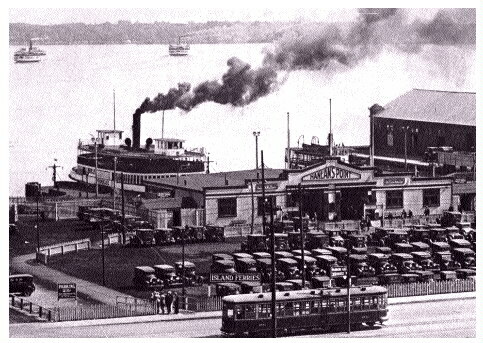 This shows the ferry terminal for Toronto Islands. Note the Hanlan's Point sign above the terminal building's main entrance, and the Island Ferries sign at the left side of the parking lot beside the pedestrian entrance. It appears just above this end of the Witt tram car seen in the foreground. Two smaller signs on the terminal read Ward's Island and Island Park. Parking was 25 cents. The ferry belching smoke is Primrose. In the background, two more ferries ply the harbour between here and the island. The same year (1927 from another source), the park was sold to The City of Toronto which operated it through The Toronto Transport Commission until the mid 1930s. 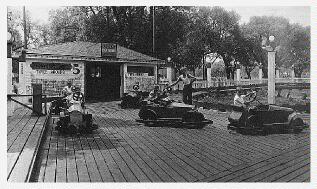 Some of the attractions in the park at the start of the 1930s were miniature golf, the carousel, a Whip" (Mangels), and a miniature railway called "The Honeymoon Special". This seems to be the same as the miniature railway that was in the park at the turn of the century, although one photo shows the locomotive with what appears to be a 4-4-2 configuration, rather than 4-4-0, as mentioned earlier. As well, the locomotive looks to be slightly different from earlier photos, and rolling stock consisted of only three cars, as opposed to the original five. Perhaps this was a different locomotive and rolling stock, and the Herschell unit had been sold earlier than the park's closing, making this a replacement train. 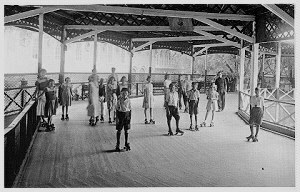 The rink was an open-air building with wooden slat flooring. Note the sound system speaker above the skaters, Center Top. In the background is the stadium. At that time, despite the addition of more rides such as The "Autocars" (likely a Traver "Auto-Ride"), popularity had decreased to the point where the park was closed -- The Depression being the final blow. The city also wanted to construct an airport on the island which eventually opened in 1939, so demolition began, apparently with the stadium in 1937 and the moving of over two dozen houses to another island. Another sign that the park was at its end was that the Island ferries Mayflower and Primrose (both launched in 1890) were removed from passenger service in 1938 to become freight haulers. Boys smile for the camera as they drive "twice around" in their electric cars. The manufacturer is unknown but the cars appear to be an early Traver Manufacturing design. Note the wood-slat track. Other items mentioned for the island in the 1940s were The Manitou Hotel and Ginn's Casino, but it's unclear if they were associated with Hanlan Memorial Park. Since it would seen odd that new facilities were built at a failing park, I would have to say that the ballroom and rink may have been the same structures as at Hanlan's. Modern maps show that the airport property does not cover all of the former Hanlan's Point amusement area. This park was south of the then new (1939) Port George VI Airfield, which is the present-day Toronto Island Airport, officially: "Toronto City Centre Airport". 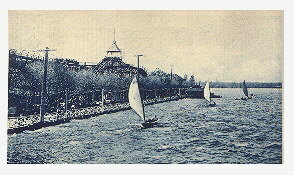 It occupied the southern section of the original Hanlan's Point Amusement Park. The National Carousel Association says that a carousel was at Hanlan's from 1903 until 1921 and it went to Lakeside Park in St. Catherines. This seems to be wrong as Lakeside's carousel most likely came from Scarboro Beach Park and there are photos of the Hanlan carousel taken after 1921. Investigations are continuing. By the 1950s, the beaches were allowed to overgrow with vegetation giving a swampy appearance and so patronship declined. It now seems that the rink and remaining rides were destroyed or removed during that decade, most likely in 1955. That was the same year Sunnyside Amusement Park closed, of which its opening had been a major cause of the decline of the original Hanlan's Point. 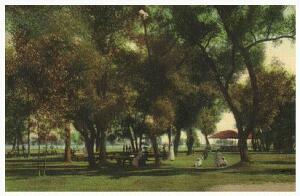 The park was transferred to The Metro Parks Commission in April of 1956. They developed it into a day-use park. This was the fate of many amusement parks in Canada which were, or became, government owned. Beaches and bathing facilities were tidied up, New signs were installed. Swamps and flood-prone areas were filled in. Picnic areas sported new playground equipment, tables, and washrooms. The city continued to buy up private land and by the early 1960s, the remaining houses were removed. Since then, the islands have also seen the creation of a marina, an amusement park (Centreville) and a petting zoo. Also established were nature areas and wildlife preserves. Today the Hanlan park has a cook-out picnic section and a beach with two wading pools. In 1999, the clothing-optional beach status was restored. There are also walking and biking trails, softball diamonds, tennis and volleyball courts, and refreshment stands. The area is still known as "Hanlan Memorial Park". Sunday, although the park itself was for picnicking and bathing. I'd like to credit Toronto historian, Mike Filey as a major source of Hanlan's Point information in this article. Michael has written many books and articles on the history of Toronto and the surrounding area. Thanks to Janna Rasmussen of Buffalo, New York for submitting the Herschell train information. A thankyou goes to Joe Greene of Helotes, Texas for the postcard scans of the park from the air, and for submitting a correction regarding the "Arcade" sign on the 1910 stadium. Thanks to Ben Fullerton of Fletcher's Lake, Nova Scotia and Paul Lindsay of Dartmouth, Nova Scotia for additional postcard scan work.